Marvel’s Avengers are in New York’s Times Square. A new pop-up exhibition and store, at the Discovery Times Square Center, is Marvel's way of touting its Avenger series with a pop-up presence and point of retail for licensed merchandise. The walk-in, 10,000-square-foot storefront digital exercise is an interactive gesture, touch and immersion gallery comprising rooms devoted to four of Stan Lee's iconic cartoon characters: the Incredible Hulk, Captain America, Iron Man and Thor. The interactive elements include a Captain America pod, where you can see his godlike emergence from wherever he comes from; an Avenger performance endurance test with biometric feedback, where one, if so inclined, can compare results with the uber patriot's. There is an interactive screen to "witness the Incredible Hulk’s brain," and how the grey matter changes -- or probably shrinks -- from Bruce Banner's to the Hulk's. At the end of the experience, visitor traffic flows into a retail space. The space, developed by Brightline Interactive, which created interactive/digital elements, and exhibit design firm Victory Hill, has been open for just over a week and will remain open for the next six months. Erik Muendel, CEO and CCO of the Alexandria, Va.-based Brightline (which has done work for brands like Pepsi, HTC, Sprint, and the U.S. Army) tells Marketing Daily that the program benefits from a licensing agreement with Marvel, which is involved in the experience’s look and feel. "Because it's so media-heavy, everything we do has been reviewed by Marvel." The relationship with Discovery is evinced by the educational elements within the exhibit, notes Muendel. 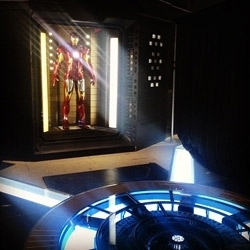 For example, the Thor exhibit -- in a separate room that sports a hologram of the character’s hammer, his suits and other gear -- has NASA-centric screens dealing with time travel, the concept of wormholes and theoretical physics in general, he says. Marvel and Discovery Times Square Center anticipate that it will bring in an average of 3,000 fans per day through its Jan. 5 end date.